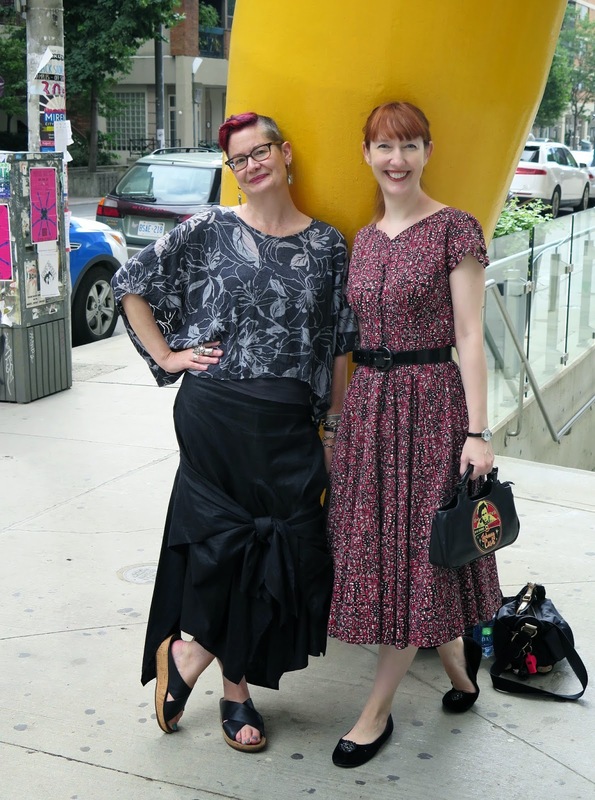 This past Friday, two working girls took a vacation day, and made a road trip to Toronto to check out a pop up vintage store that had opened there in July. As you can see from the photo, Linda and I have very different personal styles (Linda found her vintage dress at a yard sale), which makes us ideal shopping companions as there's no chance we would be fighting over the same stuff. We both love visiting Toronto - it's only two hours away by Greyhound from London, and yet it seems worlds away when it comes to things to see and do. This was also the perfect opportunity to test out my new camera. 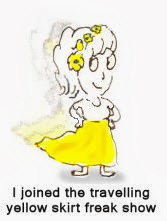 My old one had become very unreliable, and a blogger without a camera is like a cowboy without a horse. Many thanks to the adorable young man who offered to take our photo. 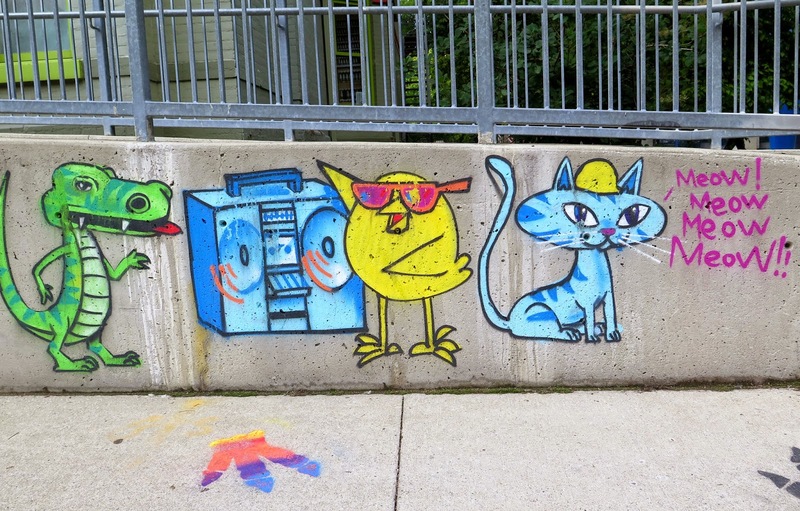 The stretch of McCaul Street between Dundas and Queen is home to one of my favourite pieces of street art. I don't know how long the colourful portrait has been there, but it has been at least several years, and I am always relieved to see that no one has defaced it. 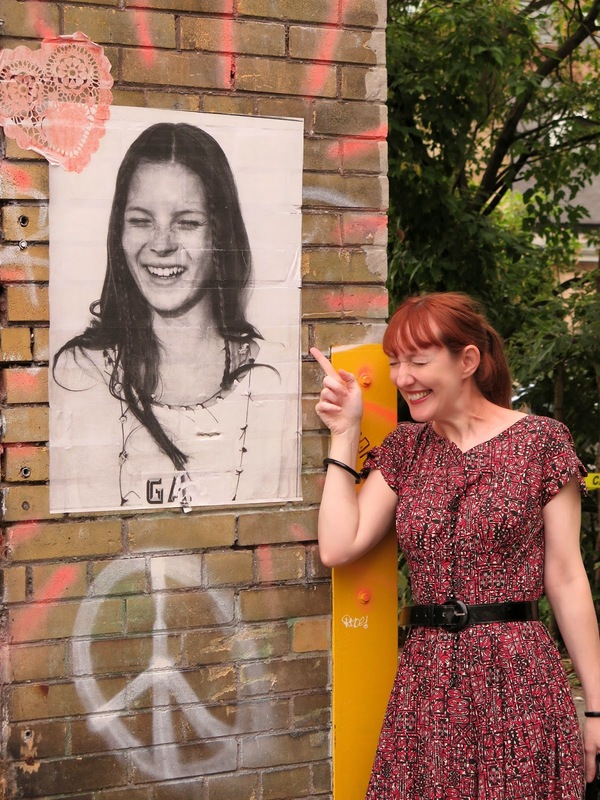 I don't remember this photo of a very young Kate Moss (if it's not her, it certainly looks like her) being there the last time I was in the neighbourhood. We came across a few of these "Reality Alerts" on poster boards. 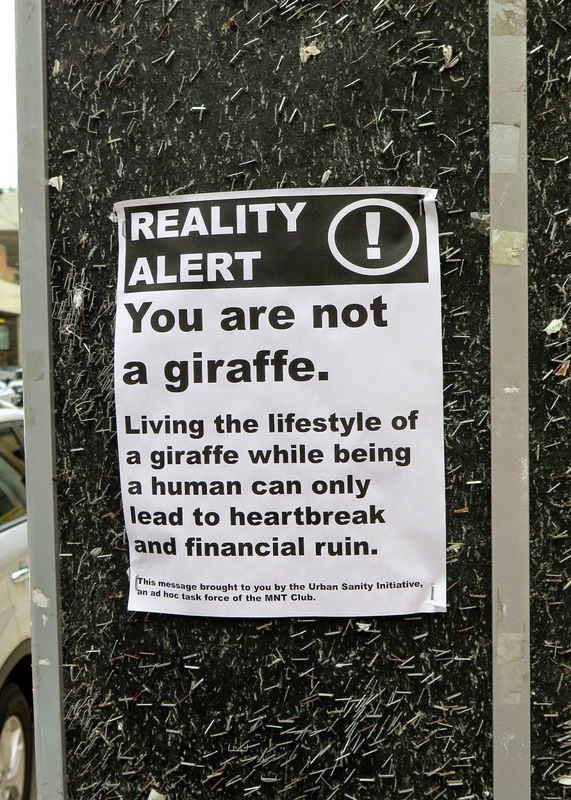 Apparently, sometimes you need to be reminded that you are not a giraffe. Thank you, Urban Sanity Initiative. 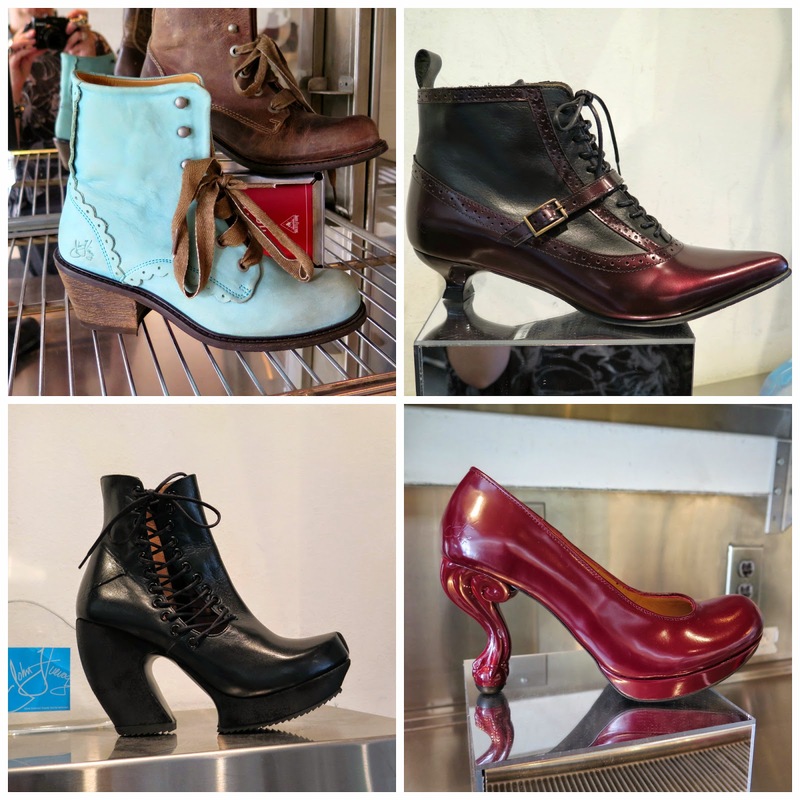 The Queen Street West Fluevog store was just around the corner, so we stopped in to check out the new fall shoes. I consider myself fortunate Fluevogs don't fit my feet, otherwise, I would be in worse financial shape than I already am. My heart did a little flip-flop at the sight of those side-laced black ankle boots. 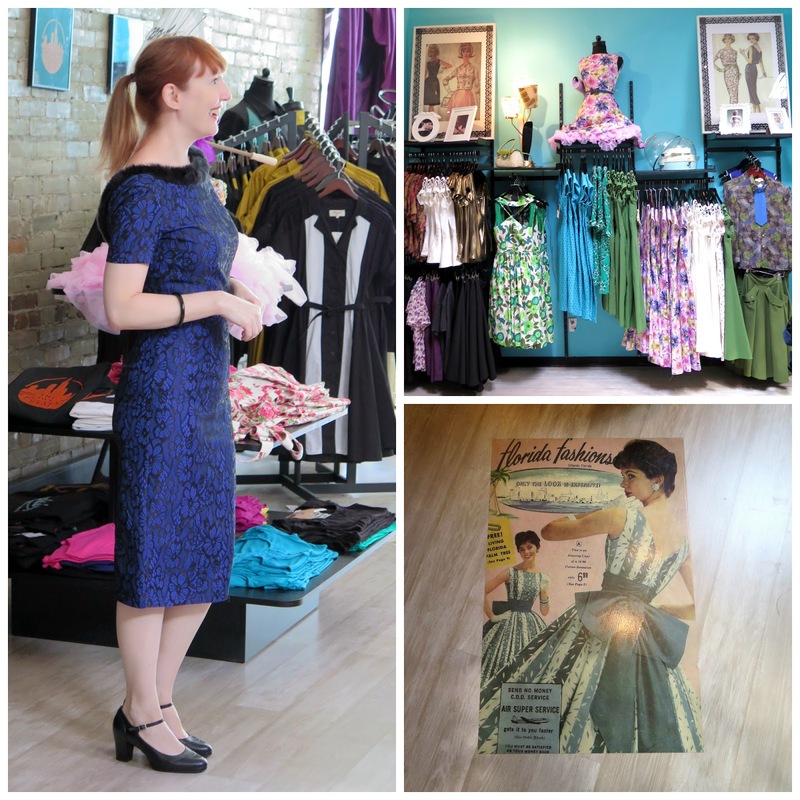 After a yummy lunch, our first stop was Tatyana, a store specializing in retro-inspired women's wear. The store is named after the founder and lead designer, Tatyana Khomyakova. In 2006, Russian fashion model Khomyakova founded Bettie Page Clothing, but unfortunately, a lawsuit by a celebrity-licensing company resulted in the company's name being changed to Tatyana designs. Linda fell in love with a sleek fur-trimmed dress (she's wearing it in the photo on the left in the above collage). The neckline dips to a low "V" in the back and it fit her like a dream. It was relatively expensive, and the fur trim meant it would be a pain to clean so it stayed in the store. 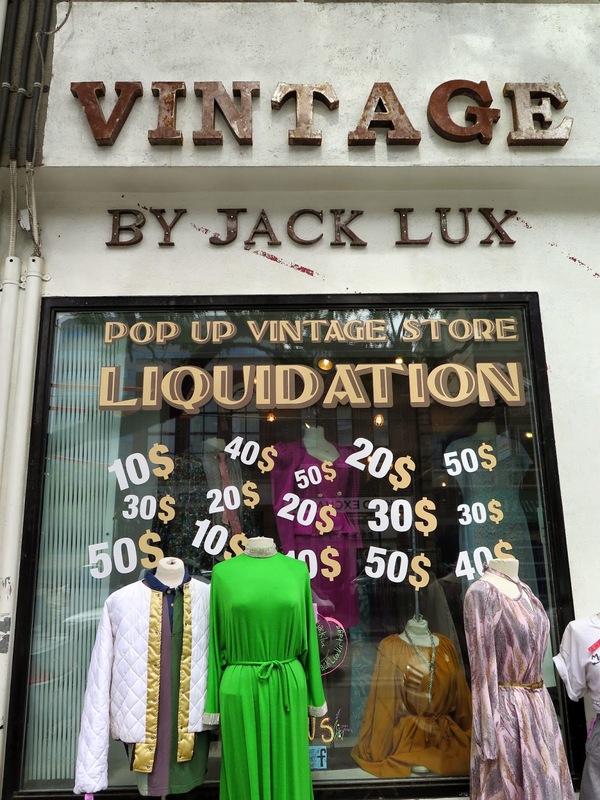 So, this was our primary destination - a pop up store opened by Montreal's Jack Lux Vintage to sell off a collection of vintage clothing formerly owned by the Quebec Government. The collection, consisting of thousands of pieces from the 1920's - 1990's, was part of a costume archive used for film shoots and theatre productions. When the organization was dismantled, Jack Lux acquired the collection, and is selling off the pieces over the next couple of months in an empty storefront at 546 Queen Street West. It was rather overwhelming, as the stock is organized by item (dresses, jackets, skirts, etc.) but not size, so you have to be prepared to look through racks and racks of clothes to find items that might fit you. You also have to check over the items carefully as many of them showed signs of wear, from small holes, to significant sweat stains. According to the signs, prices ranged from $10 - $80, but we didn't find anything under $20 during our visit. I had spoken to a couple of people who had visited the shop before we did and they both said they found some good stuff at reasonable prices. We each tried on a few dresses, but were somewhat disappointed that much of the stock was just not that exciting. 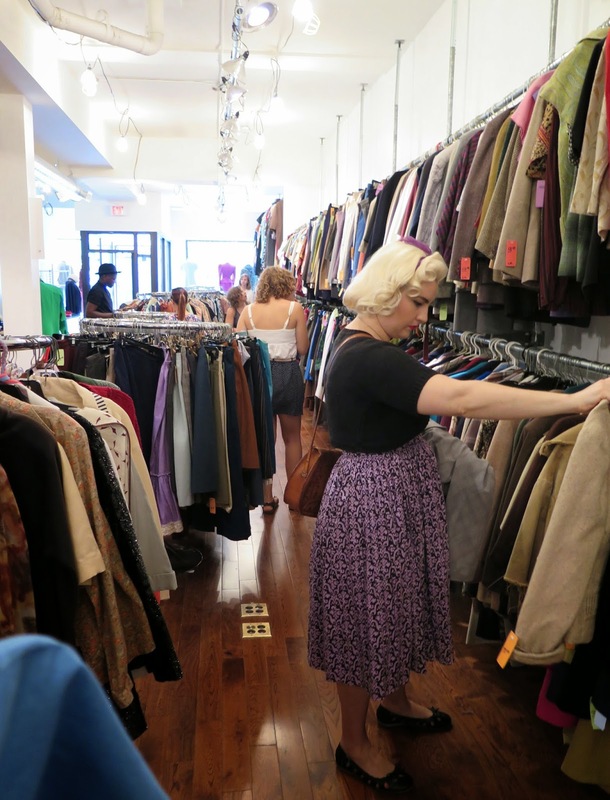 Although the stock is replenished regularly, it seemed that the best stuff must have been snatched up by Toronto vintage fans as soon as the store opened back in July. 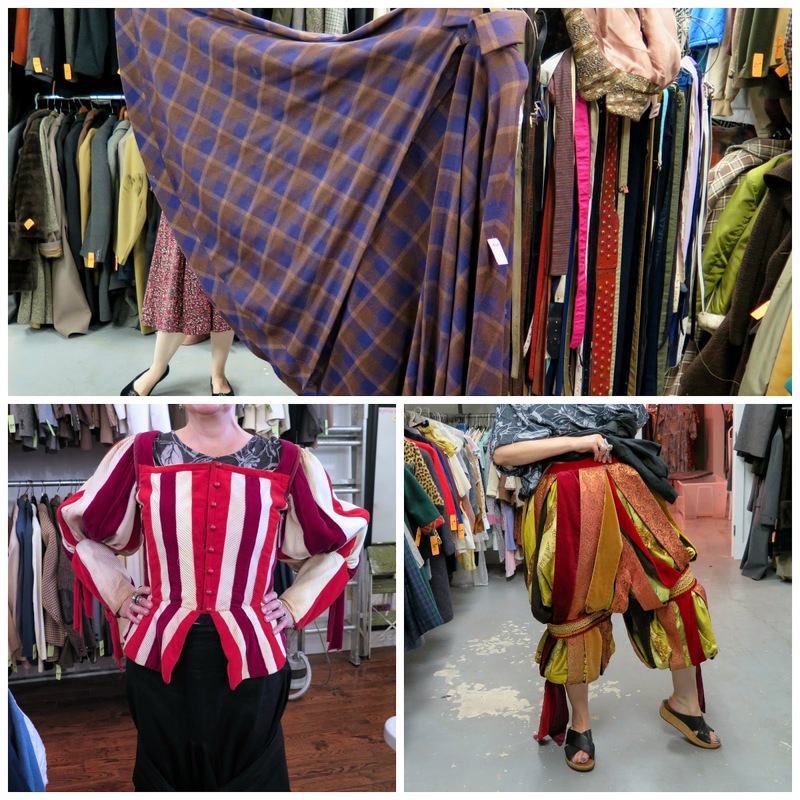 The back room of the store was wall to wall coats, and an astonishing number of capes, in all fabrics and lengths. Linda and I marvelled at the amount of fabric that went into the construction of the purple and brown checked one in the top photo. If you went strolling the moors on a windy day wearing that, you would likely end up being blown away. In the center of the room was a rack full of costumes that looked like they would have been used in productions set in Shakespeare's time. Some of the more elaborate dresses and waistcoats showed signs of having had a lively life on stage, and as much as I loved playing dress up, I knew that I would never wear a pair of velvet and brocade knickers that easily weighed 15 - 20 lbs (although I did have to try them on). I developed a rather large crush on the cream/magenta/red corset top that I'm wearing in the bottom left photo, but the price was beyond my budget for an item with numerous stains that were never going to come out, and that would probably end up hanging on my wall. 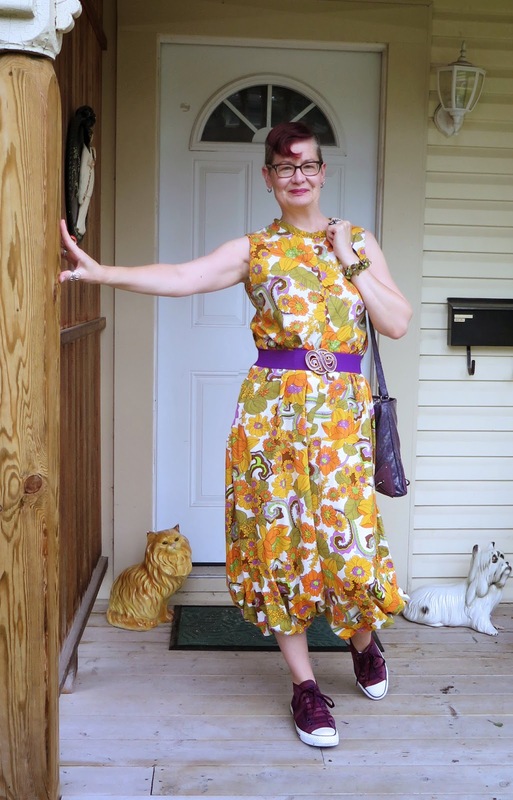 I purchased a blue cotton jumpsuit that had a definitely "Rosie The Riveter" vibe, which oddly enough, was the first item that Linda noticed when we entered the store. It was in excellent condition, fit perfectly, and priced at $20. If the warm weather sticks around for a bit longer, it may show up on a blog post in the near future. If I happen to be in Toronto before the shop closes I may visit again, as I am curious to see what else might be lurking in the warehouse where the stock is being stored until it makes its way into the shop. Across the street from the Jack Lux store we noticed a vintage clothing store that neither of us had seen before called Mama Loves You Vintage. The store is a relatively new addition to the Queen Street West strip, and is operated by a mother-daughter team; mother Melo sources the stock in Vancouver, and daughter Mahro runs the store. We were impressed with the quality of the clothing, and the design of the store which had a cozy, bohemian vibe. Even though there was a lot of stock, the store felt spacious and was very well-organized. You can see photos of the store here. I'm thinking this is likely from the 70's. I'm not usually a fan of floral prints, but the colour combination won me over. The gigantic balloon legs brings to mind something a clown might on a vacation at a summer resort. I still like it, despite the clown reference, and I wore it on Saturday when I met Heather for a quick trip to the market. It kind of felt like I was wearing my jammies. Our day was drawing to a close and Linda still hadn't made a purchase. On our way to the bus station, we passed by Original, and I dragged her into the rainbow-coloured store as she had never been inside. While the store has a reputation as Prom Dress Central, it is jam-packed with so much fun stuff that I make it a regular stop whenever I'm in the neighbourhood. 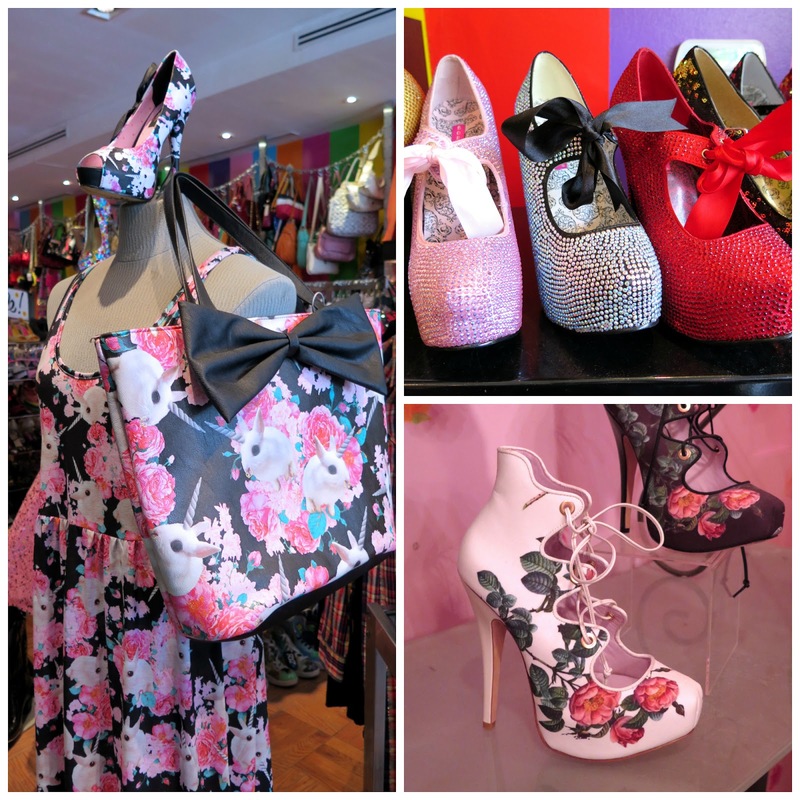 The shoe selection is overwhelming, and you can find wigs, crinolines, candy-coloured jewellery by Betsey Johnson, and feathered headpieces. I purchased the black and white feathered fascinator I wore in this post from last fall here. I can say with absolute certainty there is not another store in Toronto where you can deck yourself out in a head-to-toe print of unicorn bunnies wearing gold nose-rings. Part of me wishes I could wear a pair of those red studded platforms, or the rose-patterned Vivienne Westwood heels just for one night. While I was taking in the eye-candy downstairs, Linda made her way up the rainbow staircase to the second floor dress emporium. I was just about to go upstairs looking for her when she emerged, wearing this stunning dress by the retro-inspired brand, Stop Staring. It looked like it was made for her, and when she tried on another dress from the same company, this one in red with black trim, the charming store employee who was helping her told her she should be modelling for the company. Linda had finally found her treasure of the day. We arrived at the Greyhound station having enjoyed a glorious day of warm sunshine, yummy food, and looking at pretty clothes. It was a wonderful day on the town! I'm loving your insanely fabulous jumpsuit and Linda's elegant dress. You girls did well! I'm interested in the fact that you like clothes arranged in sizes, I've never shopped like that. If I love it I'll find a way to wear it even if it doesn't fit. Maybe I need to change my stall layout. The outside art is brilliant. Wonder why Kate Moss has turned up outside? If it's not a large store packed with stock, I don't mind if the stock isn't sized, as you and I know that S-M-LG often means nothing. There is a vintage store in Toronto that organizes their stock by colour, which is kind of cool. I'm sure your stall layout is great! A day out with a good pal is a wonderful thing, isn't it? And you and Linda certainly made the most of your trip to Toronto. I love seeing the street art, the shops, and the two of you enjoying yourselves. 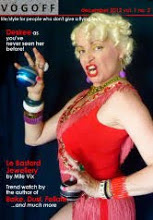 I agree, Linda should be snapped up by a retro clothing brand, she suits those 1950s fitted dresses perfectly. And you are rocking the bright floral print jumpsuit, Shelley, its fabulous! Love the knickers! and the jumpsuit you're modeling at home. What a wonderful day - no driving, vintage galore and a friend to share it all with. xox. Be still my heart! A day of vintage shopping with a friend. Your jumpsuit is a great way to finish off the summer, decked in color and comfort. 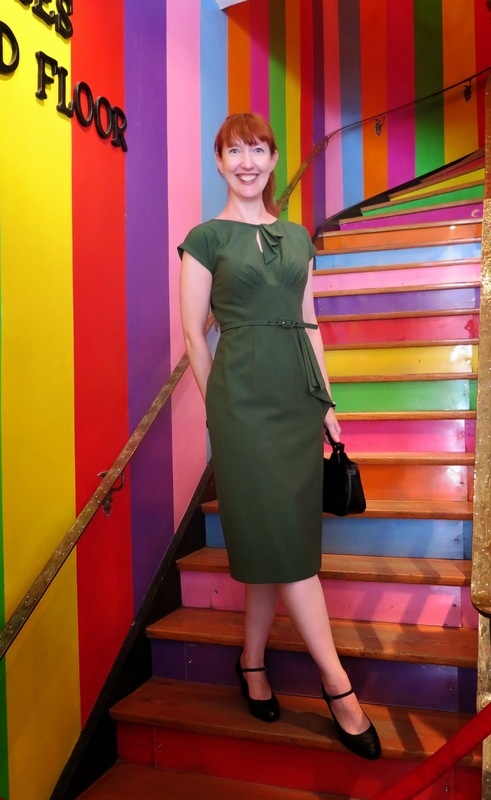 Linda is stunning in her Stop Staring dress with multicolored staircase as background. Toronto has just become a "must see" on my list of cities to visit. 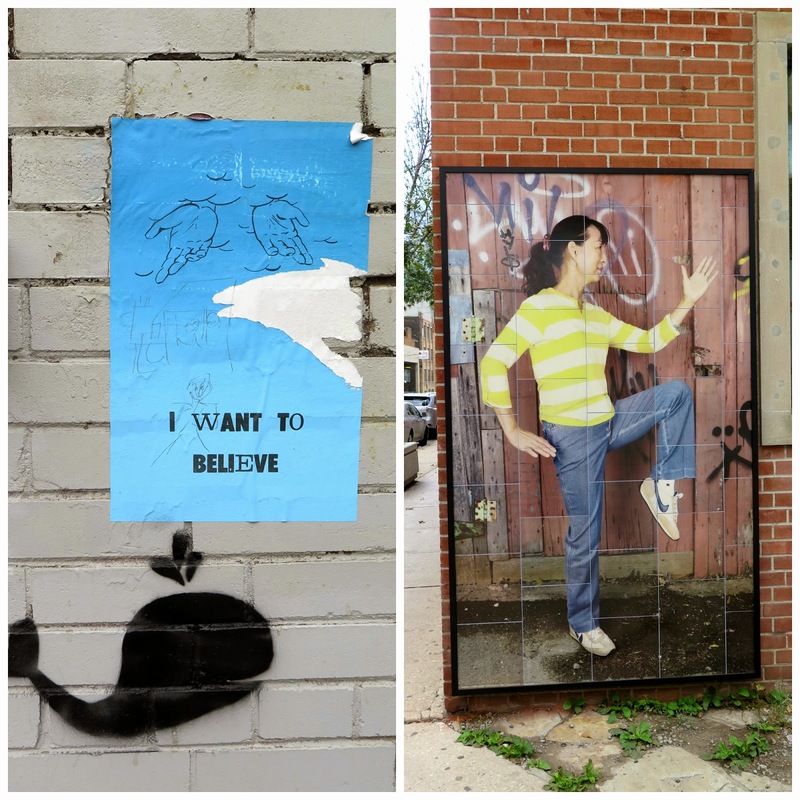 Your post made this vibrant location come alive. ooo, I love your floral bloomers dress. They would look great as an under layer too, don't you think? What a fun day trip. Art, food, friends, clothes, sunshine and no driving! What an amazing day! Your jumpsuit is so fab! Thanks for showing everyone the joys of Queen Street shopping! Feck ME I LOVE what you went home with!!! It's such a beautiful print! I don't like the word "onesies" either, for the same reason! You look SO seductive in that first photo, incidentally. What a great time you've had......Linda is a fox, and I love to shop with someone with very different tastes, or at least size, so that there's no bickering!! I am palpitating over quite a few things......the Fluevogs you like best are also my pick, that tatyana shop looks heavenly, the cape is gorgeous, and Original has stock that makes me SQUEAL! Ooo, those rose heels! OMG! If I'm ever lucvky enough to be able, I am so going to Toronto. Love the jumpsuit - fantastic!!! 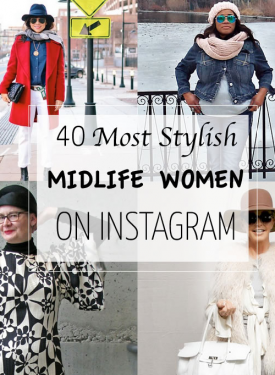 So happy to see the Lovely Linda grace your blog! Linda that dress is perfect!! Thanks for sharing Shelley! and that jumpsuit is da bomb! wouu, that's mi kinda travel!, both of you look cool and chic having fun and watching all those magnificent shops. Your friend's style is really lovely and that dress fits her so nicely!. I would love to see all those fluevogs, even if my fussy feet were not comfy in them. Because they're works of art!. And that colorful shop with all those pretty shoes (I can't wear), delightful!! 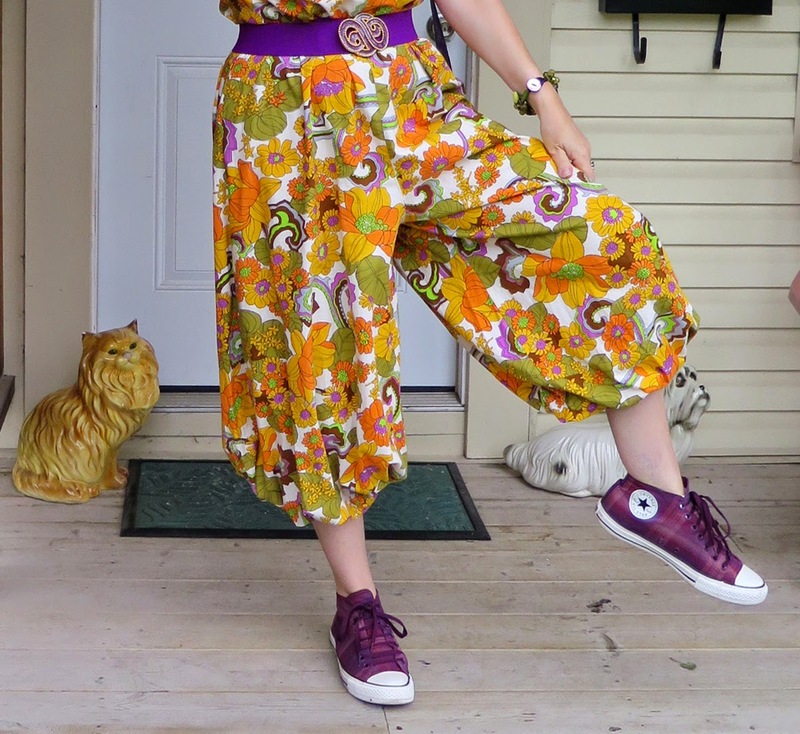 Love that you found that amazing jumpsuit, such a fabulous print and also fabulous shape!, and so cool color combo, love it with your sneakers! This could be one of my favorite posts ever! 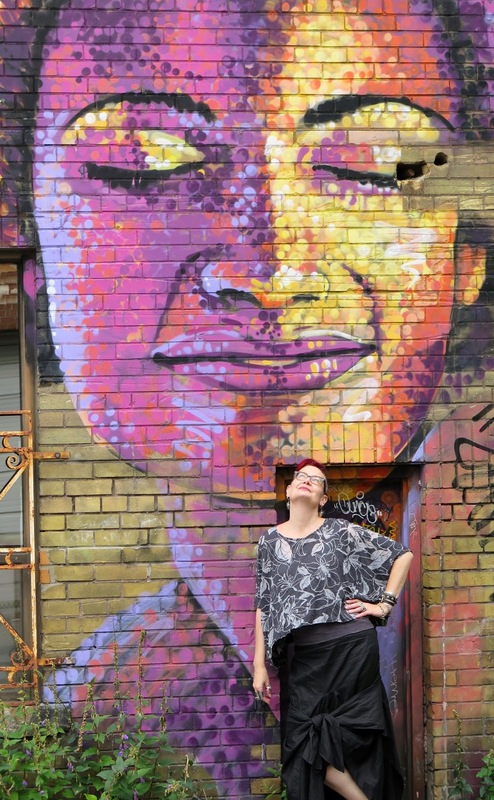 That picture of you under the beautiful graffiti face is gorgeous honey, I think you look just as beautiful in it as that mural! The one of your friend is awesome too, beautiful photos! I wish I could have gone with you but I feel like I did. Your pantsuit makes my heart flutter it's really stupendous! I also want that pink glitter dress and wish I could wear any of those can't shoes, Vix would be all over those. Too bad about the pop shop, but you did just fine with that jumper. Maybe we can chat next week! Enjoy the weekend darling! Wow! I'm so so jealous! I could never shop with Linda. We'd be after the exact same pieces. I had no idea about the pop-up shop. I need to go down to Queen West to check it out. As well as the other shops you mentioned. Those red Fluevogs are GORGEOUS!!! You really got some great photos of both of you here. You have a wonderful artistic eye. Great post about a very fun day. Love your outfit. Totally agree with your Fluevog shoe comments.